I’m going to go out on a limb here folks because right now it’s all about tomatoes. I went to the market on Saturday after a serious day of rain and they were worried the market would flood so they evacuated everyone. Big shame because all of the producers, of course, were anxious to sell their produce which they didn’t want to drag home, and in some cases couldn’t drag home because it would perish. So, right before the woman with the walkie talkie threatened to remove us physically from the premises, I became the proud owner of pounds and pounds and pounds of fresh tomatoes. My post today is not my own but comes from Marisa McClellan of Food In Jars. I don’t normally post other peoples stuff directly but I think everyone needs to experience the joy and power and pleasure of tomato conserva. So here it is, direct from Marisa via Food52. Chop tomatoes into quarters. Combine them in a large pan with 1/4 cup olive oil and bring to a simmer. Cook until they are soft and the peels begin to detach from the tomato flesh. 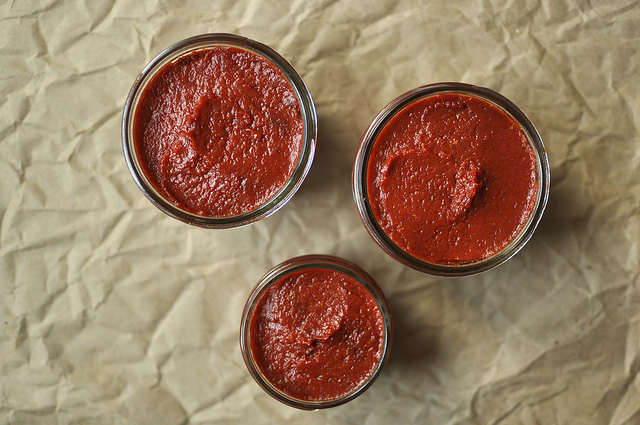 Push warm tomatoes through a food mill, sieve or chinois, so that you separate the tomato pulp from the seeds and skins. Divide the tomato pulp between two large, rimmed baking sheets (I used two half sheet pans). Place baking sheets in the oven and bake at 350° F. Check tomatoes every half hour, stirring the paste and switching the position of the baking sheets so that they reduce evenly. Over time, the conserva will start to reduce to the point where it doesn’t fill the baking sheet any more. At this point, I combine the contents of the two pans into and continue to bake. When the conserva is shiny, brick-colored and has reduced by more than half, it is done. There shouldn’t be any remaining water or moisture separating from the paste at this point. Scrape finished conserva into clean half or quarter pint jars. Top with a layer of olive oil and place in either the refrigerator or the freezer. As long as you keep it well-covered with olive oil and ensure that you only use a very clean spoon to remove it from the jar, it will keep in the fridge for a month or so. Frozen, it will keep for up to nine months. Oh my god, this looks amazing! 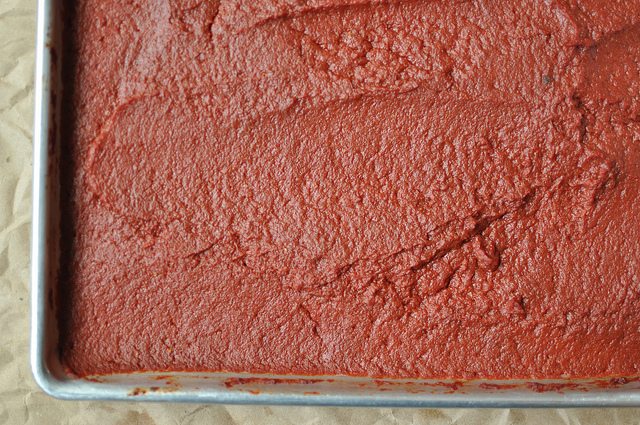 I didn’t know tomatoes could take on that nice, thick tomato paste texture just from sieving them and baking them. And lucky you to have become the owner of so many pounds of tomatoes! I can think of so many uses for this paste, especially now that we’re heading into the colder seasons… I’ll look forward to seeing what you do with it! I’m with Allison, this looks and sounds outstanding! I don’t know if I could bear to see 10 lbs of tomatoes get so small, though. :). But I bet this stuff has big flavor!